Online advertising in the Czech Republic increased by 31% year-on-year, reaching a record-high volume of almost 20bn CZK in 2016, recent survey shows. The survey was conducted by Median/Nielsen Admosphere and published by SPIR. 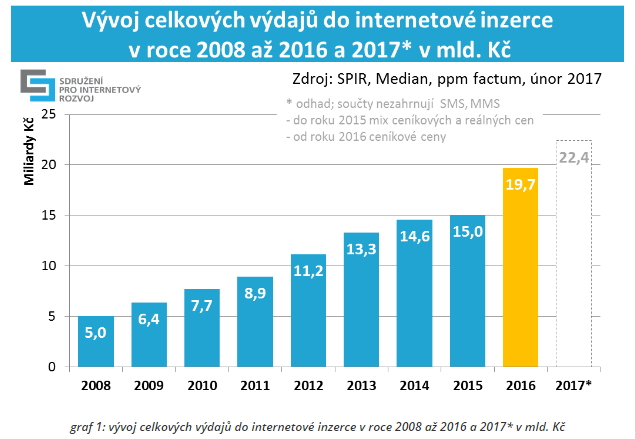 The estimate for 2017 is an increase by 14% to 22.4bn CZK.The Czech Republic is among countries where the internet is the second most important type of media after TV broadcasting and ahead of print media. Read more details in Czech, view infographic.